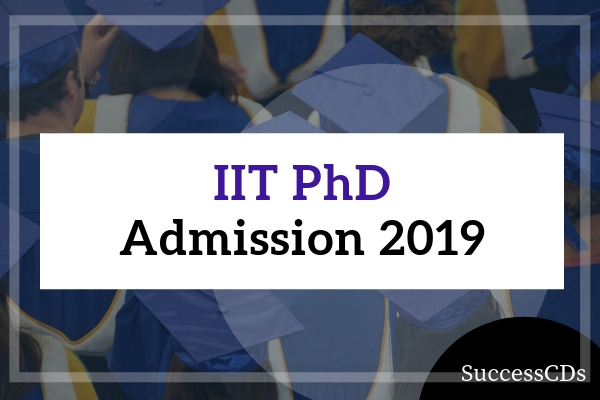 IIT PHD Admission 2019 - Ph.D. is an abbreviation for "Doctor of Philosophy " commonly called a doctoral degree. It is the highest academic degree award after a course of study by universities. Indian Institute of Technology (IIT) Ropar invites applications from Indian citizens for PhD Program in various disciplines for academic year 2019. IIT Madras Indian Institute of Technology (IIT) Madras has invited applications from eligible candidates for admission to PhD and MS (by Research) Programs under Regular/Part-Time/External Schemes of the Institute Program for the session January 2019. IIT Gandhinagar Start-early PhD Fellowship 2019 Indian Institute of Technology (IIT) Gandhinagar announces admissions for the Start-early PhD Fellowship for 2019-20 session from eligible B. Tech final year students from IITs. Applications are invited for Indian Institute of Technology (IIT) Roorkee for admission to full time/part time PhD Programs for Spring Semester of the Session 2018-19 in all departments/centres at the institute. IIT Guwahati- Applications are invited for admission to the Doctor of Philosophy (PhD) program beginning in July 2018. IIT Bhilai PhD Programs Admissions 2018- Indian Institute of Technology (IIT), Bhilai invites applications from highly motivated and the brightest students of the country for admission to Full-time/Part-time/External PhD Programs in 2018-19-M-Semester starting in July 2018. IIT Palakkad PhD and MS (Research) Admissions 2018- Indian Institute of Technology Palakkad (IITPKD) invited applications for admission to the M.S. (Research) and Ph.D. Programs for the August 2018 Semester. IIT Bombay PhD Admission 2018: Indian Institute of Technology (IIT) Bombay invites applications for admission to the PhD Programs for the Spring Semester of the academic year 2018-19, starting from January 2019. IIT Jodhpur PhD Admission 2018 - Indian Institute of Technology (IIT), Jodhpur invites applications for admission to Doctor of Philosophy (PhD) Programs for the Semester commencing in July 2018. IIT Kharagpur PhD Admission 2018 - Indian Institute of Technology (IIT), Kharagpur has invited applications for admission to the PhD Program (Regular, Sponsored and Working Professional and Individual Fellowship (i.e. CSIR/UGC/DBT/ICMR/INSPIRE Categories) of the Institute in the Spring Semester of 2018-19. IIT BHU MTech, M.Pharm, PhD Admissions 2018- IIT BHU offers admission to M.Tech., M.Pharm. and PhD Programs (Odd Semester) in various departments /schools for the academic session 2018-19. IIT Dharwad PhD Admission 2018 - Indian Institute of Technology Dharwad (IIT Dharwad) invites applications for admission to PhD (Doctoral of Philosophy) Program for the academic year 2018-19. IIT Ropar PhD, MS and MTech Admissions 2018 Notification - Indian Institute of Technology (IIT), Ropar invites applications for admission to Master of Science (M.S) by Research Program offered in the Departments of Computer Science and Engineering Electrical Engineering, Master of Technology (M.Tech) and Doctor of Philosophy (PhD) Program Offered in the Departments of Sciences, Engineering, Humanities Center of Biomedical Engineering and Center of Materials & Energy Engineering for the session 2018. IIT Kharagpur Joint MTech/PhD-MCP Admission 2018 -IIT Kharagpur invites applications for the Joint M. Tech/MCP-PhD Program in Engineering and City Planning for the admission academic year 2018-19. IIT Goa PhD Admission 2018 - Indian Institute of Technology (IIT) Goa, applications are invited online for admission to the PhD Program for the academic year 2018-19 starting from July 2018. IIT Gandhinagar PhD Admission 2018 - Indian Institute of Technology (IIT), Gandhinagar invites applications for admission to Doctor of Philosophy (PhD) Program Semester II offered in various disciplines for the session 2018-19.